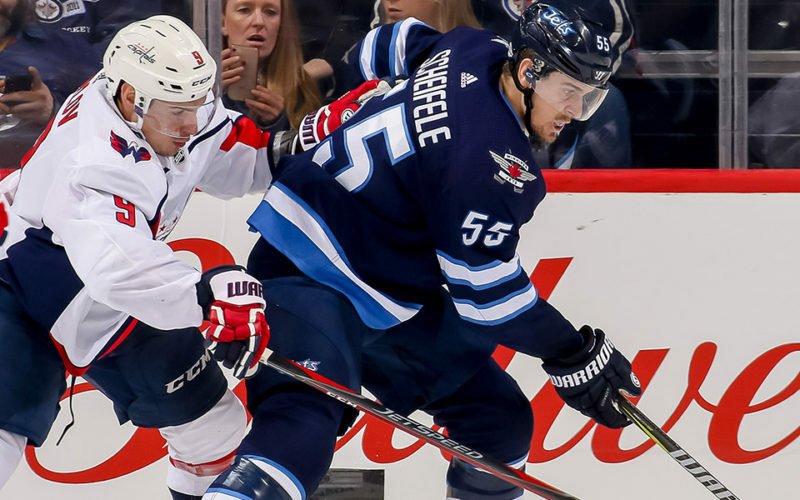 Jakub Vrana took a pass from Madison Bowey at his own blueline, moved into the Jets zone, and snapped a shot from the top of the right circle over the shoulder of Connor Hellebuyck and in. While on the power play, Blake Wheeler sent a pass down low to Kyle Connor ,who fed Mark Scheifele in the slot. Scheifele one-timed a shot blocker-side on Pheonix Copley and in. Brandon Tanev passed to Ben Chiarot at the red line. Chiarot moved into the Capitals zone and let a wrist shot go that beat Pheonix Copley under the glove and in. With the Capitals net empty, Kyle Connor gathered the loose puck and from his own blueline fired the puck into the empty net. Were outshot 10-2 in the first period. It ties the two shots the Jets had in the second period Oct. 11 at NSH for the least amount of shots the Jets have had in a period this season. Led the Jets with 25:53 of ice time tonight. Extended his point streak to three games (4G, 3A) with his goal in the second period. Extended his goal streak to three games (4G). Is just the second player in Jets/Thrashers history to record a double-digit point streak on multiple occasions. The other: Ilya Kovalchuk (10GP from Dec. 10-28, 2009 and 10 GP from Dec. 27 – Jan. 15, 2008). Scored his third goal of the season tonight, which is a career-high. Scored the first GWG of his career. Led the Jets with four hits. Lowry leads the Jets with 54 hits on the season.